Summer has arrived on the sagebrush steppe of southwest Wyoming! Frosty mornings and spring snows feel far away in the baking, dry heat of long summer days. Soils are drying out and the spring annuals I so enjoyed only a month ago have dried up and blown away. The yellow highlights of mock goldenweed (Stenotus acaulis) have been replaced by the red of senescent Sandberg’s bluegrass (Poa secunda) and the sheen of maturing needle and thread grass (Hesperostipa comata) tossing in the wind. Only a few brave plants continue to flower—shortstem buckwheat (Eriogonum brevicaule), rusty lupine (Lupinus pusillus), bushy bird’s-beak (Cordylanthus ramosus)—but these are sparse acts in the long, dry intermission before the grand finale of Fall, when the sagebrush will finally begin to bloom. This year, the 4th of July marked my last day in the field. It was a solo trip—how better to celebrate Independence Day than alone in the midst of our most precious national resource: our public lands! The first site I visited is a low spot to the east of the Fontenelle Dam, which experienced near-total sagebrush mortality during the 2014 sagebrush die-off. Last summer, I established one of my first plots in this spot, but when I was entering data last Fall, I discovered that I hadn’t recorded the infiltration rate for this location—so I’m back to collect that information today. The sagebrush die-off is most severe in low places across the landscape, and one of our hypotheses is that unusually high precipitation in September of 2013 and subsequent flooding in lowland landscape positions is responsible—at least in part—for the die-off. 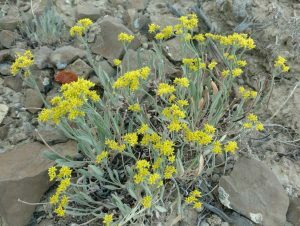 Severe drought conditions in 2012 may explain sagebrush mortality in upland landscape positions. I will spend the next two months working with a soil-water simulation model to re-create the soil-water conditions leading up to the sagebrush die-off. In drylands, run-off and ponding are not usually an important component of the ecosystem water balance, because most rain events are small and do not exceed the soil’s capacity to absorb water. Thus, the soil-water model was not designed to include run-off or ponding. Yet, land managers in southwest Wyoming reported standing water in September of 2013. We will modify the model to incorporate run-off and ponding, using the infiltration data I collected at each plot. 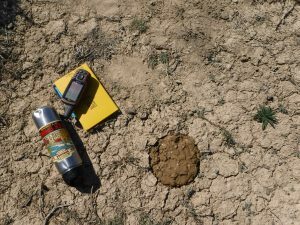 I measure infiltration rates using a protocol developed by the National Resources Conservation Service. First, I insert a 6-inch diameter plastic ring into the soil about 2 inches. I place a sheet of plastic wrap over the ring and pour 444 mL of water (equivalent to 1 inch of water within the 6-inch ring) into the plastic wrap. I gently remove the plastic wrap and start a stopwatch to record the amount of time it takes for the water to infiltrate. This wets the soil, and once the water has infiltrated, I add another 444 mL in the same manner to measure the rate of infiltration. 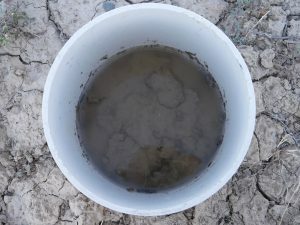 Infiltration rates are affected by physical and chemical soil properties, including texture (the relative amount of sand, silt, and clay) and rocks as well as vegetation and soil salinity. The topsoil of the plot I am visiting has a clay loam texture (in New Haven this spring, I analyzed 450 soil samples from the 95 plots I established last summer), and I anticipate that infiltration will be slow in this fine-textured soil. The first inch of water takes about 15 minutes to infiltrate. The second inch of water always takes much longer, and after adding another 444 mL of water and resetting my watch, I settle down on the dusty, bare ground to wait. 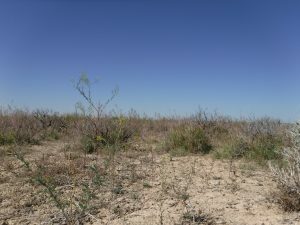 It has been five years since the record-setting drought of 2012, four since the flooding, and three since the sagebrush die-off, and much of the ground around me is cracked and bare. Yet, sitting quietly level with the dry skeletons of the dead sagebrush, this place is vibrantly alive. As my attention lifts from the 6-inch ring in the soil, I become aware of the sharp, scolding barks of a prairie dog about 20 meters away. I can see its little head and dark eye-markings over the tops of the sagebrush. A second prairie dog chimes in from time to time, always a little off-beat with the other one. A close look reveals tiny sagebrush seedlings and the shed exoskeleton of a grasshopper nymph. Overhead, two ravens croak and flap—probably visiting the steppe from the nearby campground on the Green River. A songbird stands on the tallest sagebrush in sight—a rare living shrub amidst the die-off—and belts out a bright and cheerful territorial song. Cliff swallows from under the bridge over the river skim the sagebrush around me, flashing their white bellies, with their wings making sounds like rough tissue paper. Under the warming morning sun, grasshoppers clack their clumsy wings in flight. In front of me, a stand of herb sophia (Descurainia sophia)—an introduced annual mustard—boasts a healthy crop of mature pods, but the plants still present optimistic yellow flowers to the sky from the tops of their branches, hoping that rain and pollinators will permit a bumper crop this year. The forecast predicts no rain this week, but as I watch, the scintillating green of a native bee catches my eye. She flies from branch to branch, probing the yellow flowers for nectar, a full load of pollen collected in the hairs of her back legs. An hour and a half later, the second inch of water has finally infiltrated and I remove the plastic ring and walk back to my car with the data I need, leaving behind only a 6-inch wide wet spot from the infiltration ring in the dry, cracked soil. This entry was posted in Botany, Western Research Fellows, Western Resource Fellows, WRF 2017 and tagged Rachel Renne. Bookmark the permalink.